Every year we host an art contest for local schoolchildren. We provide the theme and they provide the imagination and talent! For the 8th year, local schoolchildren have displayed their talent for our annual art contest. This year, 168 kids from kindergarten through 6th grade immortalized their favorite sport by creating artwork based on the theme Cars With Game! A cash prize was awarded to the winner in each grade level, as well as one for Best in Show. Sadly, not all entries could win, but every child’s effort is recognized. Each non-winning entry was returned to its creator with a consolation prize. We are very proud to announce the winners for this year’s contest. The winners, their families, and their art teachers were invited to an award ceremony at our facility on April 23rd where Ralph Hipp from WIBW - Channel 13 once again presented the prizes and interviewed the children for the evening news! Be sure to stop by and see the winning creations! They are on display in our coffee area. For the seventh consecutive year, we hosted an art contest for local schoolchildren. This year’s theme was Cars That Rock – and they really did! Ralph Hipp from WIBW - Channel 13 was on hand to emcee the event, present the prizes and interview the children. Hollywood came to Yingling’s Auto Service in April as we hosted our sixth annual art contest for local schoolchildren in grades kindergarten through sixth. 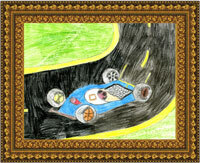 This year’s theme – Cars That Are Stars – challenged the kids to draw their favorite vehicle from TV and the movies. As always, they met the challenge with flying colors! For the fifth consecutive year, Yingling’s Auto Service hosted our annual art contest for local schoolchildren in grades kindergarten through sixth. This year’s theme was Cars from Outer Space and as always, the kids delivered some amazing art. Entries were judged by a panel of design professionals, and a cash prize was awarded to the winner of each grade level, as well as one for Best in Show. With 200 entries received, choosing the winners was no easy task! Thanks to the creative students at local elementary schools, the Yingling’s lobby is filled with dazzling art from our fourth annual art contest. Once again, our area artists have blown us away with their talent. 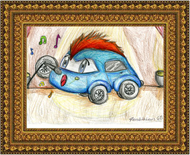 The theme for this year’s contest was Circus Cars. The students outdid themselves with drawings of elephants, ringleaders, trapeze artists, clowns and other circus regulars driving some very inventive vehicles. While we loved all the pieces of art that were sent in, we had to choose a few winners. The awards ceremony took place at Yingling’s on May 13 —a day later than planned due to a troublesome tornado warning. The Best in Show winner and a winner from each grade were each presented with a cash prize by WIBW TV’s Ralph Hipp. All the students who took part in the art contest received a certificate for putt-putt golf as a thank you for sharing their talent. Thank you again to all the students, teachers and art teachers who have made these art contests so much fun past four years. We can’t wait to see what our young artists come up with next year. Yingling’s Auto Service hosted its 3rd Annual Art Contest for local elementary school children. The theme was If Animals Could Drive…What Would They Drive? Students and teachers in the community have received the contest with great enthusiasm. Yingling’s Auto Service received 157 entries from students grades K-5, from four local schools. 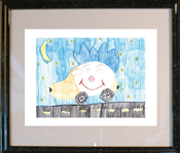 All of the winning artwork has been professionally framed and will be displayed in the Yingling’s Auto Service reception area for one full year. Winning students received $50 prizes and will take their framed artwork home after it has been displayed. Consolation prizes of two free rounds of putt-putt golf gift certificates were given to all entrants. Cake and refreshments were served to the winners and their guests, and once again, local WIBW TV personality Ralph Hipp appeared as the guest emcee. The award presentation for the winning entries was held Wednesday, May 14, at 5:00 p.m.at Yingling’s Auto Service. Be sure to check out the winning artwork created by these talented young artists during your next visit to Yingling’s Auto Service. Yingling‘s Auto Service is proud to have hosted its 2nd Annual Art Contest for students attending local elementary schools. This years theme was My Dream Car. The contest began on April 7 and this year we had 295 entries! It was a really tough decision to choose winners. Unfortunately, not all could make it into the finals, but in recognition of their efforts, all entrants received a prize with their returned artwork. The award presentation for the winning entries was held at Yingling’s on Thursday, June 5th. Once again we were honored to have Ralph Hipp from TV Channel 13 as our emcee. All entries were professionally framed and will be displayed in the Yingling’s Auto Service reception area for one year. Be sure to stop by to see all of the winning entries! Yingling‘s Auto Service is proud to announce its 1st Annual Art Contest for students attending three local elementary schools. Yingling‘s is excited to be able to give these students the chance to not only win great prizes, but to shine by being spotlighted at Yingling‘s. The inaugural contest theme was Cars of the Future . The contest began on March 12th and 45 entries were submitted from the schools on March 30th. Illustrations could be done by hand in any media (paint, pencil, marker, etc. ), but not by computer. Judging took place the second week of April by professional artists. An award ceremony was held at Yingling‘s for all contest winners on May 2nd at 5:00 pm. Cake and refreshments were served to the winners and their guests and local WIBW TV personality Ralph Hipp appeared as the guest award emcee. The presentation aired on Friday, May 4th on WIBW TV channel 13. A winners in each grade level K-6 and Best in Show, each won a $50 prize. All participants received a gift coupon and free oil change card for their great effort. 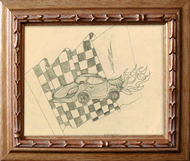 The winning students not only received a prize, but had their artwork professionally framed and displayed in the Yingling‘s Auto Service reception area for a year. After that, they got to take home their framed pictures for their families to enjoy. Be sure to stop by the Yingling’s Auto Service reception area during your next visit to view the winning artwork by these talented young artists!